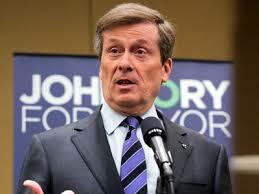 John Tory put his worst foot forward last Sunday. The future mayor of Toronto foolishly appeared at the Negev Dinner, a huge fundraising affair for the Jewish National Fund (JNF). Tory was joined by another Canadian who should have known better, comic Martin Short. The JNF is complicit in Israel’s illegal occupation of Palestinian land.And what is embarrassing for Canadian you get a nice fat tax break for supporting another country’s oppression. Yes,the Canadian Revenue Agency will give you a tax credit even though its contrary to the Canadian Human Rights Act. 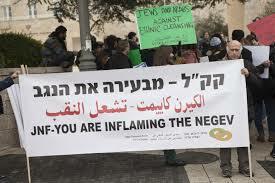 The JNF as we know(should not the mayor of Toronto’s largest city be aware of this? ) is a quasi- governmental organization which practices racial discrimination in the buying and selling of land. Palestinians need not apply.Try that in Toronto and you’d be hauled into court.We used to have racist covenants like that but common sense, the rights of citizenship and plain old human dignity ushered such discrimination into the Canadian waste bin. Alas the rabid pro-Israel Canadian government provides financial and political support to the JNF whose property will not be leased to non-Jews. A 1998 United Nations Human Rights Council report found that the JNF systematically discriminates against Palestinian citizens of Israel, who make up about 20 percent of the country’s population. Why then is the JNF a registered charity in this country? Why is the “mayor of all the people” clowning around with Martin Short at a JNF dinner? Playing domestic politics at the expense of a long-suffering people is not only insulting and insensitive.In this case it should be illegal. 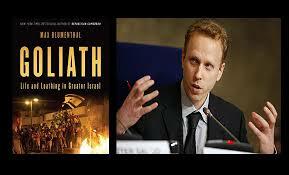 Max Blumenthal’s book Goliath is the best popular look at contemporary Israel. Blumenthal is always worth reading.Recently he toured Germany where some German politicians tried to marginalize him with the old hoary canard—antisemitic. What is interesting of course is that Merkel seems to be still quivering in the shadow of the Holocaust and Germany’s odious role. Under Merkel’s leadership, the Berlin government has been equipping Israel with submarines that reportedly carry nuclear weapons. The negation of Palestinian lives has been German policy since the days of Konrad Adenauer [chancellor of West Germany from 1949 to 1963]. In those days Israel had no problem to negotiate on Holocaust reparations with the head of the chancellery, Hans Globke, who was a known Nazi in the Third Reich. This cash flow from Germany went directly to the Israeli occupation machine that has made the Palestinians indirect victims of the Holocaust. The current bloodshed is a result of this policy and every German should ask himself: how does this policy honor the Holocaust? Blumenthal was responding to a Green party member Volker Beck who wanted Blumenthal and fellow journalist also Jewish,David Sheen silenced. The reason for this is the fact that they do not want to know of another version of Judaism and they certainly do not want to hear about the facts on the ground. Their attitude actually promotes anti-Semitism. It is simply anti-Semitic to equate Zionism with Judaism and to limit Jewish identity to the narrow confines of Israeli nationalism. For a gentile politician to do it is beyond disgusting. Why has Israel no constitution? 20% of israeli citizens are Arabs. Ask them about “the complete equality of social and political rights”. Now the supreme Prevaricator in Chief PM Netanyahu is trying to square the circle again.He and his cabinet approved a bill yesterday enshrining Israel as ‘Jewish nation-state’. So you can have democracy and a state which privileges one group? By, bye the dignity and the human rights of the Arab citizens. Their dignity as of today is about one fourth the dignity of a Jewish citizen when it comes to water, roads, garbage collection, employment in the civil service(I guess it should be 1 in 5), unemployment benefits and a radically underfunded Arab school system, one which allows the security force the Shin Bet to vet principals,teachers and caretakers.Gotta watch those subversive caretakers for sure. The latter of course is laughable.the official lie for the separate system is to ensure the Arab citizens can preserve its culture, language and heritage.” As if the state gives a damn about these things. Always, always the language coming from the state is couched in the most liberal,democratic language.Its purpose of course is to hide the truth. In 2012 the brilliant academic thhe Israeli professor of education at the Hebrew University of Jerusalem, Nurit Peled-Elhanan eviscerated the Israeli school system when it came its anti-Arab racism. 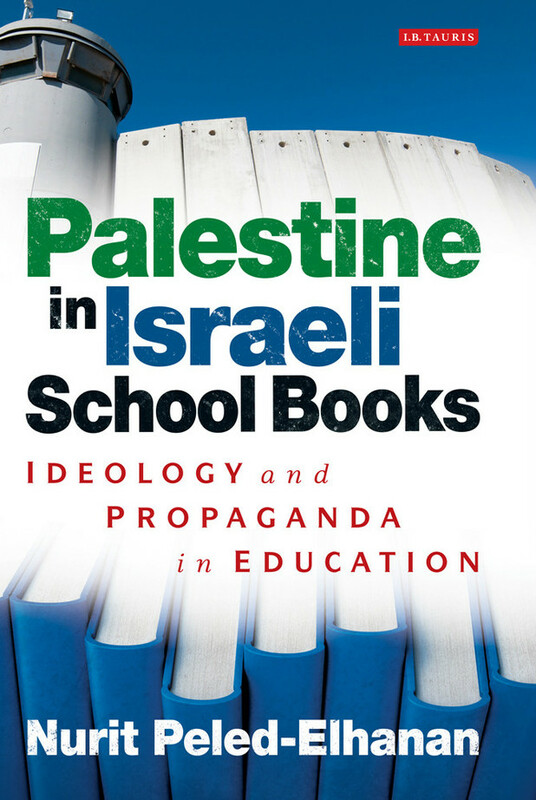 Examining 17 israeli text books on history,geography and civics, she concluded,”“The books studied here harness the past to the benefit of the … Israeli policy of expansion, whether they were published during leftist or right-wing [education] ministries” (224). A first, on Bill Maher’s HBO show which runs of Friday nights. Maher is a funny smart guy, an English grad from Cornell who actually reads books and follows the news.His whole show and the bright guests he brings on, comment on the events of the day.Maher’s wit provides the laughs.He always has some Tea Party type on, usually a guy who makes you wonder about democracy.There’s always a lead off interview with newsmaker-Maher plays it straight and is a good interviewer.Last week he had Naomi Klein on. Now nobody’s perfect and Maher has real blind spots about religion.He even made a bad movie about “believers called Religulosus or something like that, a cringe inducing types cheap shot at the most embarrassing types of Christians..An ex-Catholic he prides himself on his atheism.He loves Dawkins and Sam Harris. He will never have a sharp Jesuit on who might disrupt Bill’s cardboard versions of Christianity. Last week Andrew Sullivan appeared, a frequent guest, thoughtful gay Catholic who blogs for the Atlantic. They both gushed over the authentic Catholicism of Francis and his canning of one of the worst “serf decorator” Cardinals we’ve seen in a long time.Cardinal Burke. Funny it happened on a comedian’s show and not on the CBC or CTV. The Jewish National Fund (JNF) is complicit in Israel’s illegal occupation of Palestinian territories, supporting West Bank settlements and settlers in East Jerusalem.. Because JNF-Canada has official Canada Revenue Agency charitable status, it provides tax credits for donations, meaning that up to 25% of their budget effectively comes from our taxes. Only in a country so deeply in league with Israel’s occupation would use every lever, legal or illegal to support this ongoing oppression.This is the shame of the power of Canadain PM Stephen Harperwho seems to have cowed the Canda Revenue Agancy into silence over what appaers to be a shocking abuse of the tax system. Based on the following facts, I am calling on the Minister of National Revenue to initiate the revocation of the JNF’s charitable status. JNF activities are not charitable, and its policies and actions run contrary to the Canadian Human Rights Act, Canada Revenue Agency Policy Statement CPS-021 concerning Registering Charities that Promote Racial Equality, and which flouts international law. The JNF is a quasi-governmental organization in Israel that practices racial discrimination in the provision of land and housing, as its charter states that it cannot lease or sell its land to non-Jews . 20% of Israel’s population is non-Jewish. Israel’s Attorney General (2005), the U.S. State Department (2013), and the United Nations Committee on Economic, Social and Cultural rights (1998) have all deemed the JNF to be a racially discriminatory organization. Its mandate is to acquire land for Jews only! Palestinian citizens of Israel are barred from leasing or buying JNF land. Sheikh Saya A l-Thuri in his address to us called the JNF “the biggest terrorist group, attempting to steal land we cultivated.” It turns out the JNF forest to be planted on the ruins of al Araqib is simply part og a greenwash the Negev so that more jewish immigration can fill the outhern part of Israel.This part of the Blueprint Negav camapaign to be decribed tomorrow. “This racist government is invading us.The Al Touris have been here since 1905.Where was Netanyahu in 1905 (Answer Netanyahu’s real name is Milikovsky. 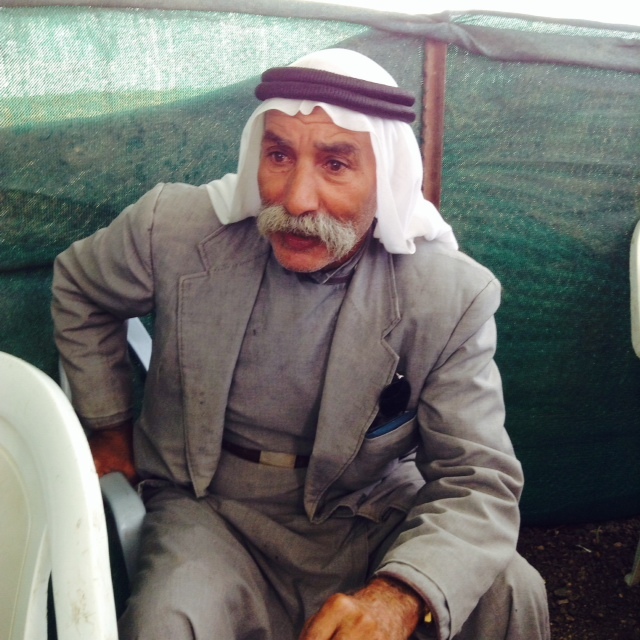 His grandfather Nathan changed it when he emigrated from Lithuania in 1920) There are no laws to defend the Bedouin. Our orange, date and olive trees have been uprooted for what? A pine forest and a new road, all funded by the JNF! We are citizens of Israel. Should a state not defend its citizens.What does it mean that we are a “unrecognized village”? We have to pay all our money to lawyers to defend our ancestral land.The IDF comes in and bulldozes our little village and then requests 2 million shekels to pay for the clean up! Pressure must be put on the Jewish National Fund.These are our private lands.The JNF is no respecter of we Bedouins. 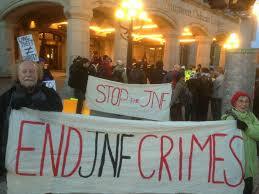 STOP THE JEWISH NATIONAL FUND (JNF)! Between Simcoe and John Sts. 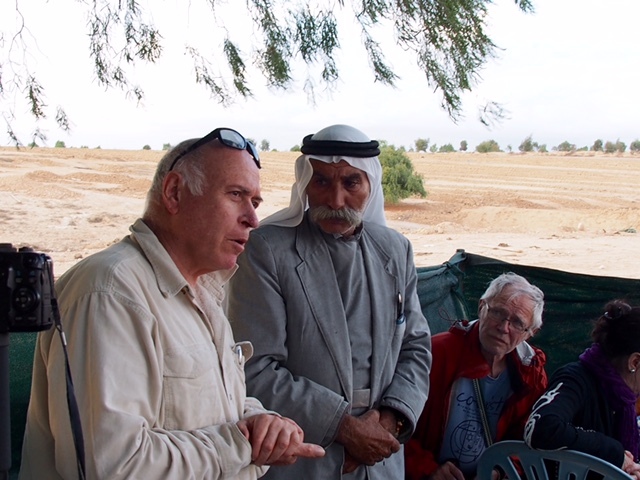 Al Araqib is a small Bedouin village in the Negev desert which we entered in earlyNovember.What a shocking tale unfolded amid the legendary Palestinian hospitality and the beautiful warm embrace between another “Jew of conscience” Amos Gvirtz and the Bedouin villagers. The Bedouin have been in the Negev since Jesus was a boy—and much earlier.They are legendary farmers and grazers.In the 1948 ethnic cleansing of Palestine there were 60,000 to 110,000 who raised their sheep and goats,farmed barley,wheat and lived in tent villages.By 1960 the strategy of Israel which is still operative was to force these original inhabitants out.Only 11,000 remained.The rest were forced into towns with the age old Israeli lie that they would someday come back.It never happened and the Bedouin forced to live an urban life descended into dire poverty and its accompanying social disfunction. The state simply wanted all of the land so that settlers could move in.In 1948 the Israelis owned 7-8% of the land now its 98% of the land and they want more. Fadi Samara a young Bedouin social worker who is also the manger of the Regional Council of Unrecognized Villages laid out the situation. The Israelis want the land of the “unrecognized villages”.That’s right, on Israel’s maps these villages which house the Bedouin demographic bomb of now more than 200,000 people there are no villages. Since they are unrecognized there is no government connection to water, electricity, ,sewage, elephones and roads. In this area alone the government bulldozed 1000 homes, an incredible number and of course against international law which Israel never abides by. And by the way these poor people foot the bill for the house demolitions. When we got there we were told that that Al Araqib had been destroyed 77 times. All this transference of land to the Jewish state is done in an antiseptic manner and couched in laws written in universal language. This borders on the demonic.This is happening to citizens of Israel.More tomorrow. Only on Democracy Now will you get an articulate Palestinian spokesperso, one with a long history in Jerusalem, a well known writer Rashid Khalidi is the Edward Said Professor of Arab Studies at Columbia University. He’s the author of a number of books, including his latest, Brokers of Deceit: How the U.S. Has Undermined Peace in the Middle East. As I said yesdterday apparently the CBC can not find men like him! The United States is precisely the enabler of all of this. The United States, by its diplomatic support, prevents any real pressure on Israel to stop it from occupation, settlement and repression. Tensions have been growing since the summer, and Jerusalem is the flashpoint. When, on top of the pressure that Palestinians are all under because of this occupation that’s now in its fifth decade, you have the issue of the Haram al-Sharif, the Al-Aqsa Mosque, and you have calls by senior ministers in the Israeli government, like Naftali Bennett, to completely change the status quo, to in effect take over a Muslim holy place that’s been the center of devotion for 1,400 years and, essentially, do to it what was done to the mosque in Hebron—turn it into a Jewish holy place where Muslims are occasionally allowed—you are throwing fuel on the fire. And so, ever since the last couple of months, there’s just been an escalation in tension all over the city. You have increased settlement activity that just is penetrating neighborhood after neighborhood. Arab neighborhoods that have never seen armed settlers, with a heavy military and police presence to guard them, are now slowly, but surely, being colonized one by one. And so, you’re basically turning up the heat on a very, very hot situation, and that’s been going on now for many months. Well, I think that what Amira Hass earlier said is correct. In Jerusalem, in particular, there’s an absence of leadership, but there’s an absence of leadership for the Palestinians as a whole. And that has been, I think, signaled over the Gaza crisis. It’s been signaled over the inability of the Palestinians to actually put together a reconciliation, a unity government, and to define a strategy. Well, that’s—something has to give here. I don’t think—I agree with Amira: I think that people in the West Bank are afraid. They’re both afraid of Israeli retaliation and they’re afraid of the security cooperation between the Palestinian Authority, which helps the Israelis to hold them down, and Israel. So, I’m not sure that that’s where we’re going. We may be going to more—sadly, to more horrible random acts of violence and more eruptions of kids, without leadership, in various parts of the West Bank, perhaps, and Jerusalem. Any text without a context is a pretext, said Jesse Jackson years ago. The western media for many reasons is either negligent, lazy or afraid to dig deeper on this issue. The public broadcaster CBC is terrified of the power of the Israel loving Harper government to make even more cuts. The National Post and the Toronto Sun are de facto Zionist rags. The Globe does do some good reporting(Namely Patrick Martin) but you hardly ever hear the Palestinian voice. 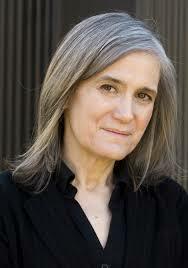 The radio is hopeless except for the intrepid Amy Goodman’s show Democracy Now. Amy anfd Juan Gonzalez consistently bring forth the voices you never hear elsewhere. In Toronto the show is carried on CIUT 89.5 on the FM dial. Today’s show was a prime example. In fact Abbas said:We strongly condemn this incident and do not accept under any circumstances attacks on civilians. At the same time we condemn these actions, we also condemn the attacks on the Al-Aqsa Mosque, holy places. As well the director of Israel’s Shin Bet domestic security service, Yoram Cohen, dismissed Netanyahu’s claim that Abbas incited the attack. No matter, Netanyahu never lets the facts get in the way. I did speak to some Palestinians in Jerusalem. And what was remarkable is that they do not approve of it. They do not approve of it, of this murder. But they share with those who perpetrated—they share the sense of despair and anger that Palestinians live with all the time, all the time. I felt that people do not dare to condemn, even though some people feel uncomfortable about such a killing, such an operation. By the way, I don’t think that the Popular Front adopted it officially. People say that the two youngsters are members or fans of the Popular Front, not necessarily members or not necessarily that they got an order from the Popular Front, but this is still to be seen. Yeah, it is very, very tense. And I was making the comparison between the neighborhood where they lived, the two men, two Abu Jamal—very crowded, very—no investment in the livelihood, in the welfare of the people—while this neighborhood is—the Har Nof neighborhood is a relatively new neighborhood on the land of the village, of the destroyed Palestinian village, Deir Yassin—very spacious, many newcomers, many new immigrants from mostly Anglo-Saxon countries. If they worked there indeed, if the two guys worked there indeed, I think that they faced every morning—they were facing—every day they were facing the Israeli apartheid, very clearly. Two Palestinian cousins armed with meat cleavers and a gun stormed a Jerusalem synagogue during morning prayers Tuesday, killing four people in the city’s bloodiest attack in years. Police killed the attackers in a shootout. Heart sick to hear this. A renegade suicide hit which makes an ugly situation even worse. All the Palestinians we met had long ago foresworn violence.Some sadly are driven to lash out. The Shin Bet security service chief Yoram Cohen told members of a Knesset committee that the perpetrators had no previous security records.He also stated that PA leadee Mahmoud Abbas does not encourage such attacks. Undoubtedly PM Netanyahu will escalate the violence and so the death dance goes on. Here is a picture taken a week ago in the Ibrahim mosque in Hebron. It was here on Feb 25,1994 that the mad settler Dr.Baruch Godstein murdered 29 Palestinians who like yesterday’s victims had come to pray. This is the first snapshot from Israel/Palestine. In no particular order, they give you a glimpse of life under occupation. We set out early on Wednesday from the Mount of Beatitudes on the Sea of Galilee to visit Elias Chacour, the recently retired Archbishop of Akko, Haifa and Allo of Galilee in the Greek Catholic Melkite Church. Abuna Chacour had agreed to meet with us in Ibillin at the marvellous educational complex, begun by him in 1983. It now includes a co-educational kindergarten, primary school, high school and gifted program for Christian, Moslem and Druze students of the area. As we walked through the facility built on the hill overlooking the town, the energy and discipline of the young Palestinians was apparent to all. Chacour met with us in a large classroom lined with a pictorial description of the development of Mar Elias which had been constructed, as are most buildings owned by non-Jews, without a permit, that is, against the directives of the Israeli government. Abuna Chacour began by drawing us out: What had we learned during our visit to his country? He listened intently and reminded us that a journalist who has spent one day in Palestine can write a book, a journalist who has spent a month can write an article and one who has spent a year there will see such complexity that she may not be able to write at all. (Regardless, we blog on.) Chacour then went on to briefly describe the details of his life as a Palestinian Arab Christian Israeli who had been born in 1939 into a large Christian family that, prior to the Nakba, lived in peace with other Jews and Moslems in Galilee. In 1948, when the Zionists drove them from their village, the devout Chacour family became refugees in their own land. The youngest of four boys, Elias was encouraged by his father to accept the call to the priesthood. After university, he studied theology at St. Sulpice Seminary in Paris. Returning to Israel in 1965, he was ordained a priest and assigned to the small village of Ibillin that became his parish and the focus of his educational activism for the next 50 years. Abuna Chacour regaled us with the story about the “illegal” construction of his high school in the early 80s. Every time the Israeli authorities showed up to see if he had a building permit he told them that he needed a building not a permit. As soon as they left, the work recommenced. He would not let the refusal to provide a permit to slow down the construction of the building. However, when he realized that the project was in jeopardy of becoming caught up in political conflict and red tape, he flew to Washington in 1981 to seek assistance from then Secretary of State James Baker. He landed unannounced at the side door of the Baker residence as the Secretary’s wife was beginning a Bible Study session on the Beatitudes. When she opened the door, Chacour introduced himself as “another man from Galilee.” When she asked if he had an appointment, Father Chacour quipped, “Appointment? We men from Galilee don’t make appointments. We make appearances.” She invited him in and he explained to the group of Washington wives that the Christian Beatitudes are not “Be Happy Attitudes.” They are a call to conversion and to peace making. Abuna Chacour became a close friend of the Susan and James Baker. On his next Middle Eastern diplomatic mission, Baker quietly intervened by hand-delivering a letter to the Israeli government supporting the initiatives of the Mar Elias Educational Institution. The necessary permits were granted. No school demolition need be feared.